Heatherton’s pupils enjoyed an inspirational sports challenge last week. The school was proud to take part for the first time in the national Sports for Champions initiative, which invites an experienced athlete into the school to speak to the children and lead them in a series of sponsored fitness challenges. Heatherton was lucky enough to enjoy a visit from international long jumper Ezekiel Ewulo, who wowed the girls with stories of his resilience and perseverance throughout his training and competitions and really inspired them to tackle their series of fitness challenges. 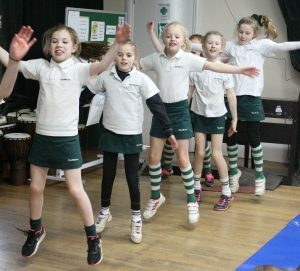 All the children (and many enthusiastic members of staff) gave it their all to complete the four-stage circuits, including leg drives, press ups, spotty dogs and star jumps, in 20-minute stages. Nearly £2,000 was raised by the event, a proportion of which goes towards helping young athletes with international potential to realise their Olympic and Commonwealth dreams by providing much needed training cost funds. And what did Ezekiel himself think of the efforts from the Heatherton pupils?